What the Granny?! I am serious! How come I don't get it? My friend Vivs (the queen of all things yarn) told me that it is easier to learn to crochet before you learn how to knit and not the other way around. 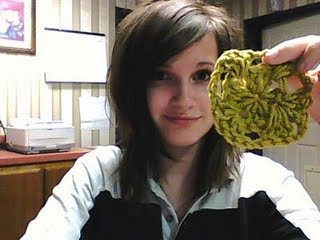 I learned to knit like 10 years ago so I am sticking to that excuse. Whatever Vivs says, goes! I mean, come on, really?! 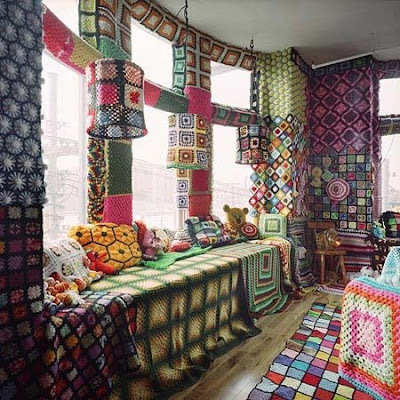 I am sooooo obsessed now with this stupid granny square that when I actually DO learn, my house will probably look like this. i started seeing the granny squares everywhere and absolutely LOVED them... showed them to my sister and told her we had to learn to do that and she said "oh, i already know how. i'll just teach you"
You can do it! Next time we see each other, if you're still learning...I'll sit down with you and we'll make three in a row so your fingers will remember how to move with the crochet needle. It's my new mission in life! Wish I could help but you do make me laugh. ;) You can do it!!! haha! that granny square room is AWESOME! my mother-in-law tried to teach me to crochet a granny square a couple years ago and LET ME TELL YOU it was almost the end of me. 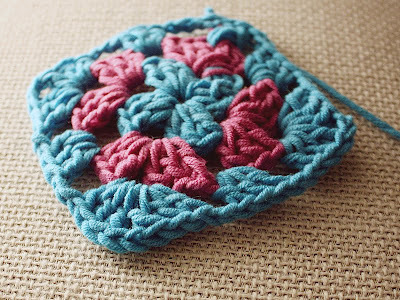 Looks like granny squares are the next big thing... everything old is new again :) Urrghh... and I'm just relearning how to knit. It's going to be a crafty autumn, that's for sure! Yikes - that really scares me! 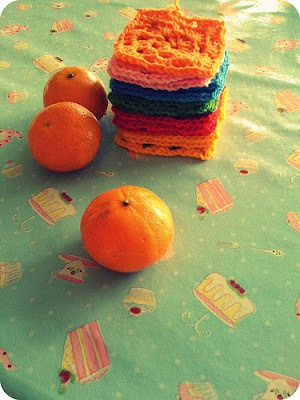 I want to learn how to make them but haven't tried yet. Watched those videos that Rachel posted and they scared me even more! I'm with you on this one - good luck! love the room of yarn, i'm relearning crochet and knitting (relearning from what i use to know as a kid), just finished my 1st coffee coozie last night. 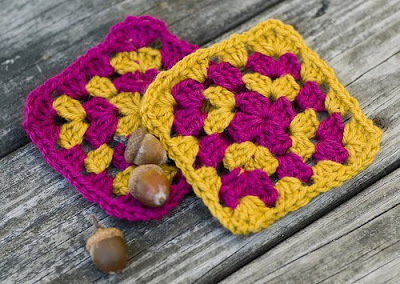 i imagine the granny square will be coming up real soon. i may have to do some more coffee coozies tho, 1st one was a little rough. my granny squares are still VERY silly looking, and i started trying waaaayyyy back when rachel first posted about them--it's honestly taken me that long to figure out the tutorials (and they're still not turning out quite as good as i'd like). you'll get it, i know you will! if i kinda can, you totally can!!! p.s. sent the quilt square today (a day later than promised, i know but it's really hard to catch the post office at an open time with school and all that). hope you like it!! Have you tried crocheting a scarf or anything yet? 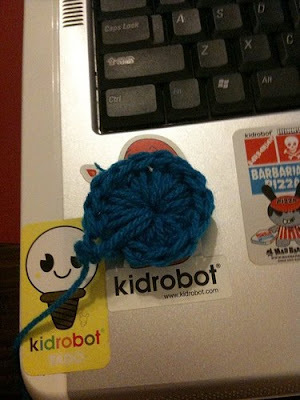 Because then you can just get the movements down for crochet and THEN learn the granny square. That is what I had to do. 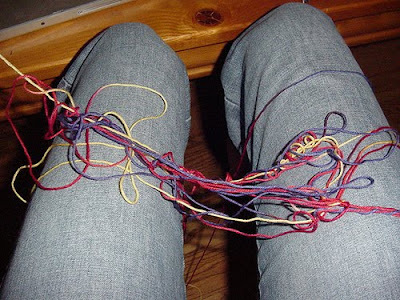 Knitting confuses me SO much. Haha. I believe in you, Janel!!!!! You had me laughing and laughing. You are so funny with your yarn going every which way. te-he! I could not do it for one week. Every night I was sitting there feeling like a granny square dropout. Then I made a circle. It was a shape, so I was estatic! 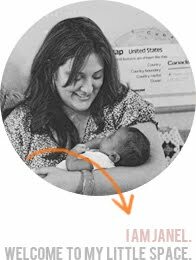 You will do it and I will see giveaways in the future of you doing granny sqaure blankets. I just know it.